Our Italian cottage is located in Luscignano, a pretty medieval hamlet with stunning views over the Apuan Mountains on the edge of beautiful Tuscany. The house is built on two levels and is fully equipped for your comfort. It is comprised of an entrance hall, two bedrooms and bathroom on the ground floor; a further hall, dining/sitting room, kitchen and balcony on the first floor. The cottage is fully centrally heated for your enjoyment in autumn and winter. The balcony is the perfect spot to have breakfast or to enjoy a glass of wine late in the afternoon or evening (table and chairs are provided). You can look down the valley across the olive groves where the locals can be seen working their land. Adjacent to the front door is a small terraced area, where it is also particularly pleasant to sit and observe and be warmly greeted by villagers engaged in the Italian tradition of passeggiata (a gentle stroll through the streets of the old village). To maximise on the stunning vista open to doors to the balcony and you can look out over the green hills of Tuscany. In the dining/lounge room you can comfortably relax on two chairs and a sofa. There is also table and chairs for 4 people where you can sit down and enjoy your freshly home cooked Italian meal. To unwind there is a flat-screen TV, DVD player and radio/CD player. There is also a small library of books and a collection of DVDs. The eat-in kitchen is stocked with a complete range of cooking utensils and crockery, oven, refrigerator a table and 4 chairs. The entrance hall on the lower floor takes you to the main bedroom which contains a very comfortable double bed, two storage units, and overlooks the valley. Also on the lower floor, the second bedroom is furnished with a double bunk, a cupboard and again a beautiful valley view. Located on the lower floor the bathroom contains shower, toilet and basin as well as a washing machine. Adjacent to the front door is a small terraced area, where you can feel the local life as you sit, observe and be warmly greeted by villagers engaged in the Italian tradition of passeggiata. On the other side of the house is the balcony overlooking the valley with olive groves and vines. It is the perfect place to sit in the afternoon or morning sun to enjoy your breakfast or an evening glass of wine. Our cottage forms part of the wall of the village of Luscignano and while this affords us wonderful views it also creates some interesting features in the cottage. A narrow spiral staircase provides access between the ground and lower ground floor but guests who find this a little too challenging can move between floors via the outside doors. Glow worms dot the gardens and woodland adjacent to the village wall and fire flies flit along the walls at night creating an illusion of fairy lights. This is lovely to witness from the balcony. The occasional deer can sometimes be seen from the balcony in the evening. Listen for the church bells ringing out over the valley. Each village has its own bells (generally rung on the hour) and its own special tune played at midday and 6pm to summon its workers back from the fields. Luscignano plays it tune at 8pm. We have not been able to identify why – perhaps our villagers worked longer and harder. NB: Instruction brochures for all appliances are provided. Tea, coffee, toilet paper, garbage bags, dish washing liquid, matches and candles provided on the basis of replenish what is used. There is a small supermarket located in the square in Casola and larger supermarkets in Aulla and Fivvizano. These are located on the map you will find in the back of an information folder on arrival. All linen needs are provided at the cottage free of charge. 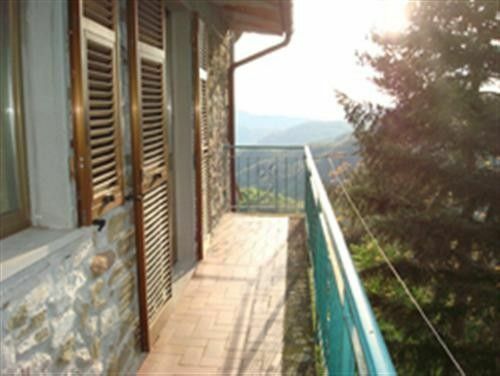 Great accommodation in Tuscany with picturesque views from the balcony. The house was equipped with all our needs with lovely neighbours and the manager was always a call away. Every morning Watching the deers in the valley with a coffee on the balcony was a great start to the day. A great getaway. The house offers all you need, the village is like a fairytale, the surrounding is a heavenly garden. Once you adapt to the experience of remoteness the village and cottage are a wonderful experience. A car is essential but most places are within easy driving distance. The cottage is well fitted out and encourages you to re-connect with the natural world around. The few people we met were very welcoming. The information provided by John and Jenny was fine and we would recommend this cottage and location to people seeking something quite different in many positive ways. Habe hier 3 wunderbare Tage verbringen können! Die Aussicht vom Balkon ist wunderbar und Nachts ist es herrlich still. The small village of Luscignano sits atop a hill overlooking olive groves and vineyards. The towns of Casola (5kms) and Fivizzano (10kms) have all the shops & services one needs, including a small market and restaurants for every occasion! We adore our Luscignano, and you will too but it is not to be confused with Lusignano near Florence as it is located in the Apuan Mountains inland from La Spezia. With a resident population of just 47 it doesn’t take long to ‘fit in’. These numbers do however grow over summer and other public holidays when people return to their family homes, particularly from La Spezia and Genoa. A piece of Europe lost in a happy time warp; Lunigiana is the area located in the northern part of Tuscany and is the 'finger' that protrudes into Ligura and Emilia. The area remains comparatively undiscovered and unspoiled, yet it is neither isolated nor remote. Your cottage is only 1 hour from Pisa and Lucca, 90 minutes from Florence, Parma and Bologna; however few tourists visit the cluster of little villages in the rolling landscape, which is sprinkled with castles of the Malaspina and Medici eras. Local trattorie are inexpensive, the wine is plentiful and cheap and the villagers are warm and friendly. The area is not overrun with discotheques and hamburger shops, leaving it with a sense of well-being, peace and an enticing atmosphere of antiquity. You will feel like you have lived here forever and leaving will be harder than you think! You might be expecting the rather commercialised Tuscany depicted in “Under the Tuscan Sun’ but whilst the Lunigiana region is located in the ‘finger of Tuscany’ it is far more mountainous, wild and rugged. The towns and villages don’t have the trappings to attract the tourist trade so you won’t be battling with other visitors but if you park your car and wander through a village you will be surprised at the variety and quality of goods to be found. The bonus is, you will likely pay a lot less than in the tourist areas. Quaint villages dot the hillsides and you can see the twinkling lights of this plethora of tiny hamlets from La Casa of an evening. Some of the villages are so tiny that they may only appear on a local map so adventuring in the area requires attention to detail and is best aided by a good GPS. Travel should be measured in time rather than kilometres as the narrow, winding roads and presence of other vehicles, bike riders and villagers enjoying passegiatta makes speed difficult. You won’t want to travel fast anyway as the views are wonderful and should be enjoyed at your leisure. From Fosdinova it is possible to look down on La Spezia and on a clear day, the Cinque Terre in all its splendour comes into view. The borgo of Ugliancaldo offers another breathtaking view over the Apuan Mountain. Your visit to La Casa di Osborne will be enhanced by interaction with the local villagers. We suggest you explore the area by day and allow time to wander the village in a leisurely fashion in the evening and mingle with the villagers when their work is finished for the day.